Only when the technology is invisible is it of any use (1990) is a work by British artist Jonathan Barnbrook, a handmade stone-carving that plays with the concept of designing objects that hide their inner mechanics and external appearances; funnily enough, you could apply the same concept to politics. Once power structures conceal their presence, once propaganda becomes a subtle act of influence, once soft power involvement is taken for granted you can identify the features that politics shares with design practices. To conceal and to reveal the features of an object doesn’t only mean to choose what features will influence how the audience will perceive it, but also and foremost to letting them know about their own environments – how your iPhone does work? How your house has been built? How your country represents itself in the world? 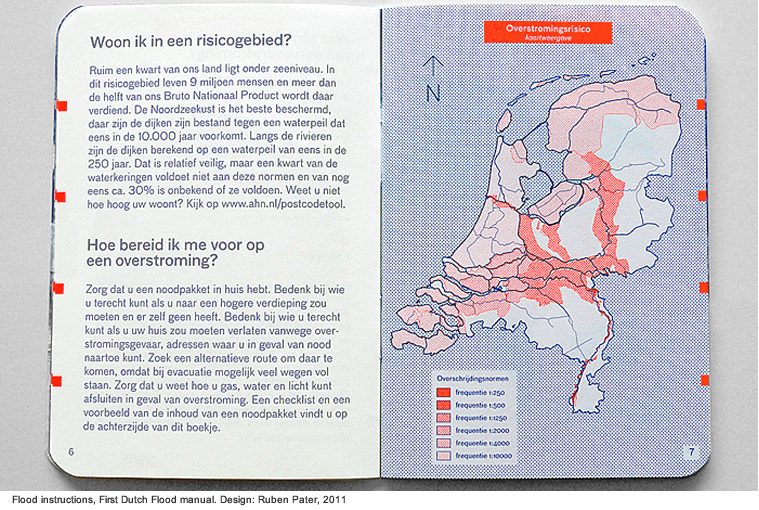 This critical approach to design finds one of its most interesting followers in Ruben Pater, a designer and researcher from Amsterdam, the Netherlands. He finished the master programme of the Sandberg institute in 2012, and as ‘Untold Stories’ he works on self-initiated and collaborative projects between journalism and graphic design. His work has received several international awards and is featured in exhibitions around the world. He was a lecturer at the Design Academy, Eindhoven, the Willem de Kooning Academy of Art in Rotterdam, and the Royal Academy of Art in The Hague. Filippo Lorenzin: The most important thing about your activity is the connection between design elements and journalism; could you tell me when and how you got interested in this specific field of interest? 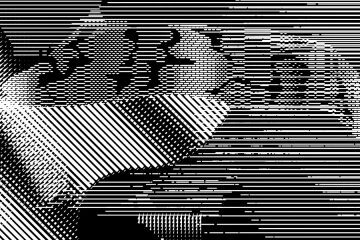 Ruben Pater: I have always been more interested in the communication part of graphic design than the just the aesthetic part. For me, writing and graphic design are two sides of the same coin. I could have ended up as a journalist, but I chose art school instead. What I do now, I still consider design because it does not follow the rules of journalism as it is usually defined. Ultimately it comes down to me trying to reach an as large as possible audience for each of my works, whatever medium achieves this the best. Filippo Lorenzin: One thing that fascinates me is the idea that design can be universal, that one message can be perceived by anyone in the same way. A graph showing data shouldn’t be tendentious but we know that it wouldn’t be such an unambiguous object. What do you think? What are the perks and the limits of using graphic design as medium to communicate facts? Ruben Pater: The notion of universal design stems from the legacy of Modernism. It was believed that the Modernist design language was so simple and devoid of cultural and subjective elements it would be the universal language of form. This “universal language” was, in fact, a Western European invention, which was implemented in the rest of the world whilst ignoring local design cultures. In the end, it has become a kind of universally accepted the language of form, but only for corporate communication and multinational capitalism. 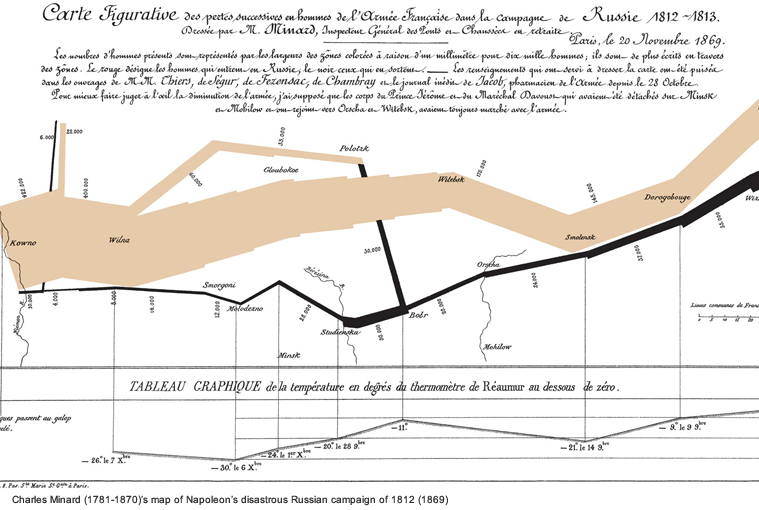 Designer Edward Tufte has shown that information design came out of the enlightenment period and was well developed before Modernism kicked in. It definitely thrived during early Modernism design since it promised a form of “neutral” communication of information which could cross barriers of language and cultures. Particular examples are Isotope from Otto Neurath from the interbellum, and the information design practised at Ulm design school in the postwar period. Information design is a great method to communicate complex information and I often use it myself. But we have to realise that every choice excludes other choices, so even information design has its bias. If you show the average income in the Netherlands, this might be factually correct, but this usually excludes informal income of black/grey markets and labour such as domestic labour or housework. This way it draws political conclusions about what we mean by income and what is regarded as paid labour. Although factually correct such a graphic statement is hardly neutral. Edward Tufte has shown us how to practice information design more ethically, and all we can do is follow his guidelines as well as possible. A completely neutral or truthful infographic—devoid of any framing or cultural bias—is not possible in my regard, but that is no problem as long as we acknowledge this. Filippo Lorenzin: I agree with you but I wonder if the audience should be aware of these bias as well; what do you think? Should non-experts learn how to critically read a piece of design? Ruben Pater: Every individual has a responsibility of their own, but I would rather not shift the focus towards the individual altogether. Citizens cannot be assumed to know everything, which is why we rely on experts to help us navigate society. Compare it to the food industry. Politicians point out the consumer’s responsibilities of reading all the labels and choosing healthy foods, instead of regulating the food industry themselves and for instance forbid companies to add HFCS to their products, or breeding livestock in horrible conditions, etc. It is the consumer who is made responsible so politicians do not have pick battles with lobbyists of the sugar and meat industries. For me, this is unacceptable since it incentivises a lack of ethics and self-reflection on the side of the industry. The same goes for the design industry, which has been involved with unethical behaviour for way too long in the name of servicing clients, from an assumed neutral position. Filippo Lorenzin: “What Technology Wants” is a book written in 2010 by Kevin Kelly in which he basically says designers and engineers don’t have to feel the burden to creating objects and platforms understanding their political and social effects on people. Your position seems specular to this; can I ask you to state in which way you understand this political nature of design? Ruben Pater: I have not read Kevin Kelly’s book, but I did read Evgeny Morozov’s response to it in “To Save Everything Click Here”, which makes it clear that Kelly is a techno-optimist of the worst kind. He shows an absolute faith in technology and a distrust in government which is exemplary for the Silicon Valley ideology. This ideology believes governments should stop spending money on public services like welfare, education and healthcare, and instead leave everything to the free market, particularly Silicon Valley tech companies. Evgeny Morozov is one of the few out there who has warned us against the dystopian future this will bring, completely hollowed-out states, with just a few ultra-rich businessmen who address any social responsibility as they please. He refers to this as the new feudalism. The design discipline has been drinking the same Kool-Aid, celebrating design thinking and promising design can solve problems which governments and NGOs cannot. Neoliberal ideology is deeply embedded in design today, and often designers do not realise their efforts are being appropriated to justify neoliberal policies. To give an example, governments are funding “design challenges”, events that ask designers to come up with a solution for big issues like climate change, inequality, world hunger, and so forth. Designers then submit ideas, do workshops, paint murals, make prototypes. Governments love this, because instead of addressing these issues on a large scale, they just spend a few thousand euros while it certainly looks like they are doing a lot. 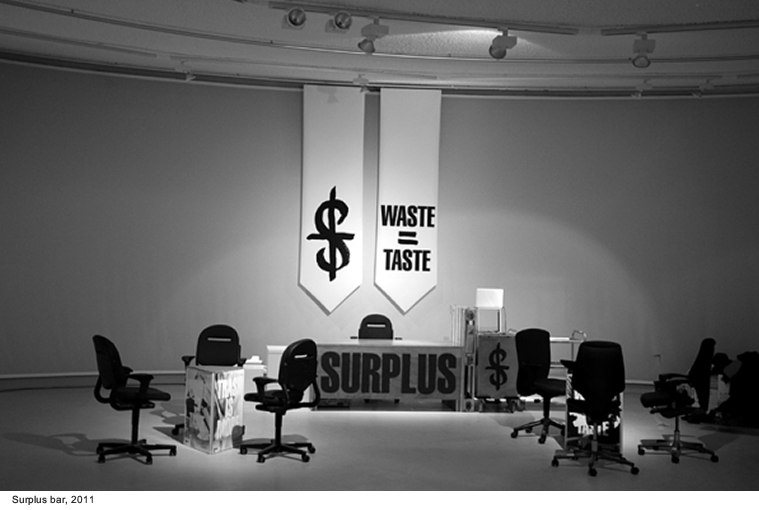 This way designers feel they are helping to create a better world, the government shows this as evidence that they are doing their part, and in the end, nothing has really been improved, as austerity measures are continued to be implemented everywhere. Designers that want to address social issues should be aware if their work does not become a tool for anti-social politics. In my book “Politics of Design” (2016), I explain how designers have agency in the effect their work has, and they should use this to their advantage. Filippo Lorenzin: In your own opinion, how can designers learn about the social and political effects of their projects? Should they acknowledge this in schools, maybe? 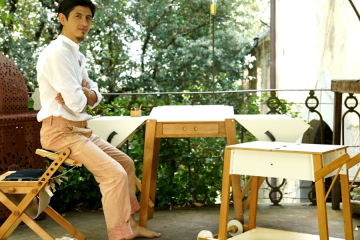 Ruben Pater: I do believe the cultural and political power of design should become part of design education. 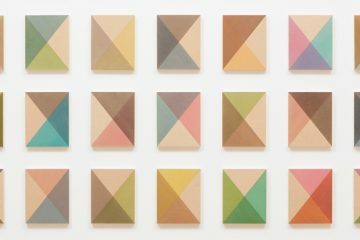 Design history is important, but some design schools offer a very outdated form of theoretic education, such as memorising lists of names of artists and artworks. If just a small amount of time which is now focused on art and design history is directed towards sociology, anthropology, and communication sciences, it would already help a great deal. This would have to be practice-based, not all students are comfortable reading long academic texts, especially if it contains academic lingo. Reading short texts, and having students find their own examples and reflect on them would work much better. Ruben Pater: I try to motivate designers to focus on making great work, and while doing that, also imagining the needs and interest of the other 99%. This is not just about doing good but more importantly, a realisation that the impact that designers on society is bigger than we think. The products we make, the messages we design all shape the perception of our society. We can influence this for instance to be less about luxury and individualism, and more about social equality and the sharing of information. What is important to keep in mind is that the political tendency in the Western world is currently a neoliberal one—to diminish social services and have the market play a bigger role in society. Public transportation, healthcare, and increasingly education is being privatised and becomes less accessible to the poorest citizens. Design should definitely concern itself with these issues, but it is also part of the private sector itself and therefore involved on several levels. When a government decides to make education unaffordable for the poor—which is currently happening in Europe—design can offer help by working on new ideas of education like MOOC’s, or new digital learning tools, but in the end, this is not a design problem, it’s austerity. So we should not just focus on designing new products or solutions, but also be prepared to point the finger back at politics. Filippo Lorenzin: Speaking of ethical and disruptive approaches to design, I would like to ask a few things about Corporate Nationality (2010). In this project, you reflected on the blurring between State and Neoliberalism logics developing a rebranding of Netherland’s official design elements that highlight the influence of corporations on the nation’s agenda. This makes me think to an old riddle, “which came first, the chicken or the egg?” where the chicken is the act of branding and the egg is the official power. In other words, every royal family, big company, democratic nation has a specific set of symbols representing their visible power and I would add that when they don’t have anything like that, it would mean they exercise an opaque influence. In this case, your project aims to show the secret dynamics behind the façade designed by official powers. What do you think? Ruben Pater: I would be hesitant to say that this work shows “secret dynamics”, or that it unfolds how state branding operates. There are many types of representations of state power, and we should not overestimate the role of a logo. For instance, you could argue that Hollywood movies have a much bigger role in representation the state power of the United States than the state logo. In this case, I was looking for clues in the redesign of the Dutch state logo that reveals how state power in Northwestern Europe has slowly shifted towards neoliberalism. I would propose this happens, partly, unconsciously through implicit ideology. First, the new design of the Dutch state logo is more authoritative in form, representing the shifting relation between citizen and state from being fatherly and caring (the welfare state) to a more impersonal and policing role (the control state). Second, the implementation and style mimic the branding of multinationals. It unifies the state institutions using a single logo with corporate colours and typefaces. This represents the shifting role of the state from a social, collective and pluriform entity towards a state which is like a business, offering services and products from one branded entity. All departments have to communicate in a homogenous manner while first they were allowed to choose their own voice and visual language. Suppressing this pluriformity in name of austerity, efficiency and risk management is typical for the neoliberal state. Filippo Lorenzin: One thing that strikes me is how the flattening of state departments’ brands is designed to affect both who already lives within its borders and the ones living outside it. It has to convey a feeling of unquestioned power and I can’t help but think of another project of yours, Patterns of Power (2011); in this case, you focused your attention on the fortified borders partitioning many parts of the world and especially on their shapes and patterns. This is a topic I’m really interested in; since I moved to London, I realised how many creative ways you can find to erect walls and borders between your property and public spaces. What kind relation do you recognise between the design of these walls and the aims of political agendas? Ruben Pater: Many people find border fences fascinating because they materialise the geography of nation-states and global power, which is usually invisible. I do not think there is any direct connection between the aesthetics of a fence or a wall and the state power that it represents, but there are some interesting conclusions that can be drawn from some aspects of the design. First of all, border fences are expensive. The double-tier fence between Spain and Morocco in Melilla costs €10 million a year just to maintain. The wall between Mexico and the U.S. that Donald Trump proposes is estimated at $25 billion. So the design of a wall depends on a lot on how much money is made available. For instance, the fence between India and Bangladesh consists of razor wire and chicken wire, while some parts of the Israeli border are concrete walls equipped with robotic snipers and infrared cameras. Second, border walls and fences are usually designed by engineers, because they have to comply with demands of durability and security. For instance, most border fences go deep into the ground under which a concrete base is built, so people cannot dig holes underneath. On few occasions, fences are made by designers, such as the Lace Fence. 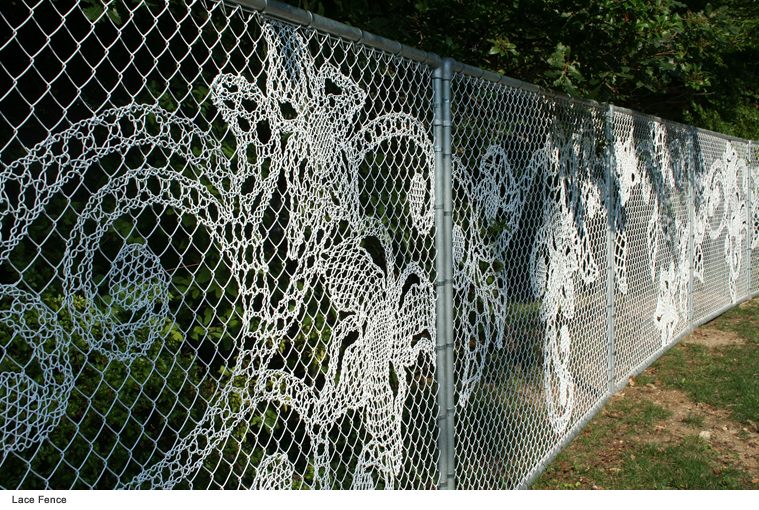 Designed in 2005 by Studio Demakersvan, a Dutch design studio, they redesigned the traditional chain link fence with ornaments of flowers folded into the metal structure. 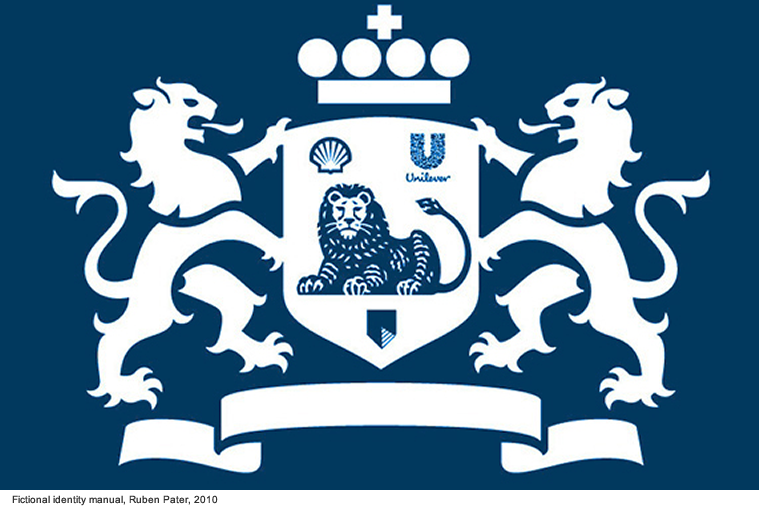 It was highly popular as an ironic and clever Dutch design. Daniel van der Velden from Metahaven wrote about this fence in 2009 and makes a connection with the rise of populist politics in the early 2000s. He calls this kind of design security aesthetics. Although the fence looks nice and it is a clever take on existing fence design, it is still a fence that is meant to keep people out. In that sense, the Lace Fence perfectly visualises the Dutch populist politics where design disguises its true violence. We want to keep foreigners and immigrants out, but we do in a humane way, with irony and self-awareness. Ruben Pater: Both projects were done in the same year, but not at the same time. The Excess of Succes (Zuidas) project happened later than the project in Kenya and Tanzania. 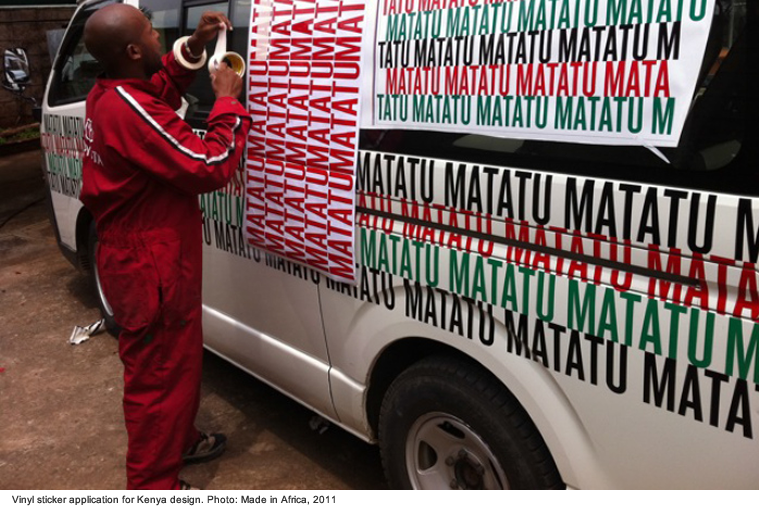 The Zuidas project was done as part of my master studies at the Sandberg institute, and while studying there I was still having a day job, for which I did the Matatu project. I do not feel they are related, one was self-initiated and the other was a commercial assignment. On a larger scale, informal economies and the appropriation of spaces through informal means has always inspired me as a designer to look beyond formal and official structures in visual communication as well. A city does not exist through planning alone, illegal civil interventions are needed to make sure social spaces that are not economically profitable can still exist. In a city like Amsterdam where gentrification is visible on a monthly basis, this is extremely necessary. Most of my favourite places in Amsterdam (bars, restaurants) are squats or former squats. Now squatting has been made illegal for some time you see this kind of social places replaced by privatised, expensive and restricted spaces. Filippo Lorenzin: In the page about Driving the News in East Africa, you state how your intervention hasn’t been well accepted by local communities and how it became something else; I found your mea culpa surprising because you don’t see everyday designers (or artists) update their audience on how their projects didn’t work, in the end. I can see you did so because it’s ethical; people can learn from your mistakes. How much important is this didactic approach to your activity as a designer? Ruben Pater: My own faults and assumptions were the main reasons to include this project on my website. The design I did is not that interesting persé, but the story around it and what I have learned is hopefully something others can benefit from. I did ask the client why they did not hire designers from Kenya in the first place, and they replied they could not find designers who were capable in their view. It should be noted the client was Dutch and not Kenyan. It is interesting that in the end, they did have to work with local designers because the design did not work at all. So I would be very hesitant to do a project like that again. Filippo Lorenzin: Describing Are you Prepared for Flooding? (2011), you state the role that critical design should have in terms of influence on reality and problematic questions; basically, you stated that to write a survival guide costs less money than building structures that should prevent and limit future potential damages. In other words, the aim is to get people aware of problems and push them to start constructive discussions. 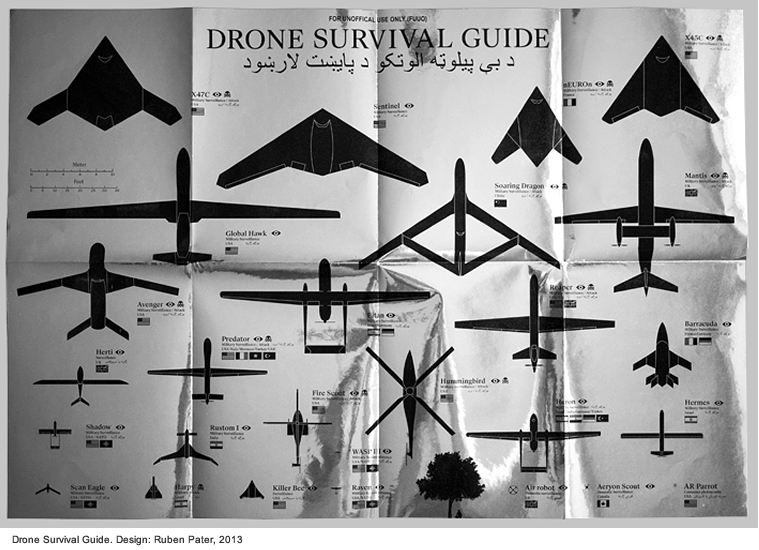 The same reflection is applied to a more recent project of yours, Twenty-first Century Birdwatching (2013); you can recognise a drone flying over your head, you can even disrupt its mission but you can’t really do anything about that – the drone will be still there, collecting and firing. I think it’s a bold statement to say that design can change the world in subtle and alternative ways in an epoch when the announcements of new electronic devices are staged as cult ceremonies (I’m thinking of Apple’s and Elon Musk’s). Could you please explain in detail this point of view? Ruben Pater: Let’s start with the positions of design on one side and the technology companies in Silicon Valley on the other. I would argue that designers are increasingly adopting the techno-optimism and libertarian ideas that Silicon Valley presents as an alternative. These companies are widely celebrated and, almost without criticism, regarded as the new saviours of our time. In reality, they represent a deep distrust in government, they do not pay any taxes and suggest that they will do a better job at collective services than governments. Secondly, they have a naive belief that technology will disrupt our world and can solve problems we have been facing for centuries, even longer. Mark Zuckerberg (who is not a medical professional, may I remind you) said he can cure all diseases by 2100, and Google’s Eric Schmidt has said that if everyone in the world would have an internet connection and a smartphone, this will end all poverty and war. For people that pride themselves on being smart, the stupidity of this is mindblowing. No technology has ever lifted people out of poverty, ended exploitation or wars. Not the steam engine, not the telegraph, not the combustion engine, and certainly not a website or an app. Designers have started to embrace a similar way of thinking. They see a rising inequality and the threat of climate change and want to do something about it, which is great. But seriously thinking that problems that are socio-economic or political at heart can be solved through design is a very dangerous assumption. Designers should be reminded that there are already systems in place to improve social, economic, and political conditions which neoliberalist policies of recent decades have hollowed out, saying the market should take care of this. As designers we are part of the market, so we should be careful not to become enablers of neoliberal policies. A 3D-printer that can print food is great, but it will not help to save the harvests which are lost to a warming climate in sub-Saharan Africa. So presenting this as an alternative enables neoliberal policies to disregard systemic change and instead focus on small flagship projects that end up, in this case, in design exhibitions and at fancy restaurants. In my work, I try to address socio-economic and political issues by sharing stories using graphic design tools. I hope my projects can be used for activism but I also realise that assuming this probably overestimates the impact of my work. Using my skills I try to translate these issues to a wider audience and I can only hope that along the process a few people can be influenced to make a positive change in their lives. 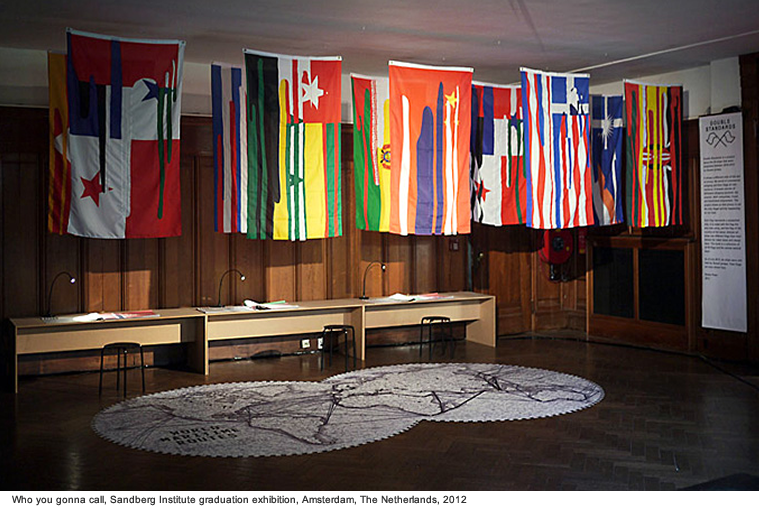 Filippo Lorenzin: It’s evident you’re very interested in the social history of your country; the past is present in many of your projects and A Taste of Dutch Colonialism (2011) is for sure one of them. What I think is very interesting about this work is how well it shows the subtle influence of colonial culture in the lives of millions of people who take it as part of their traditional heritage, even if they would not say so – “it’s part of our story and when I was young these weren’t problems”, isn’t it? So, I wonder if you think that the people that designed those sweets centuries ago were aware of the potentially offensive tone of their inventions; could it be possible that what we perceive as normal and not worth of attention today will be seen in the future as inappropriate? How can designers approach this question when they’re working on a new product? Ruben Pater: The way we construct history is continuously subject to change. Colonial times saw a legion of scientists who firmly believed that some cultures were superior to others. This form of social Darwinism was used to legitimise horrific acts like slavery, exploitation, and genocide for well into the twentieth century. We should understand history is never objective and is always biased, including today’s version of it. In hindsight this is often corrected, so yes, many things we find normal or unusual today will be seen as offensive or exploitative in a few years. One thing I hope to see changed is that we adopt a version of history that does not only put humans at its centre. Only if we realise that we share this planet – including our history – with other species, we will remain cognitively unable not make the dramatic changes to stop climate change. I am hoping for a planetary shift in our cultural and historic perception. 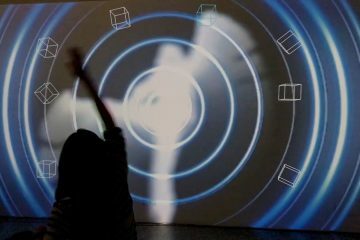 Filippo Lorenzin: A Hyperreal Artistic Spectacle (2014) was a show that aimed to reflect on the liminal role of art between spectacle and critically engaged approaches; it’s clever how the artists highlighted this question and to be honest, looking at the pictures of the event, it looked very fun. I wonder what has been the reaction of the audience, especially that part that usually doesn’t pay attention to the differences between art exhibitions that want to be entertaining for the sake of it and art shows that try to challenge their points of views. Any interesting feedback? Ruben Pater: The concept behind the exhibition was solid, but I am not sure if we succeeded as curators. As my first try at curating think, we could have done better to spatially represent the idea. Like you say, it was fun but not explicitly critical beyond the texts surrounding the events. That was kind of the point but orchestrating emotions turns out to be difficult. We did have a very strong debate that did contribute to the critical starting point. Filippo Lorenzin: The symbols of power, especially when they’re old fashioned or perceived as heritage survived to the post-modernist last decades are another recurrent object of your interest; we’ve already seen you did study how governments choose to show themselves through their corporate identity, but what you did with The Double Standards of Maritime Trade (2012) you took a step in another direction; flags, boats and pirates are matter of adventurous dreams for whole generations and this project surgically dismantle this romantic patina to show the political and economic tensions that brought people to seajack tankers for which no one was really in charge. The confusing international laws conflagrate here and what once was known as a state-driven act of violence becomes an event where you can’t find who is good and who is bad, who is the victim and who is the perpetrator. Could you tell us more about your interest in this specific state of things? Ruben Pater: Graphic designers have a weak spot for nationalist symbols like flags and country borders. We love to use them because they are simple and refer to global issues. I did use this as well in the Double Standards work, but in the end, these are not able to represent the time we live in. Just as the economy and politics are complex global constructs, so are people’s identities. What I learned from the Double Standards project was that every part of the chain of the global capitalist production and trade is inherently mysterious, complex, and dirty. Unravelling these links are necessary because they can really lift part of the curtain which hides the realities of global capitalist trade. As a designer, I have realised there are no simplistic or iconic symbols anymore that fully represent global issues. Logos of large companies like IKEA or Heineken mostly conceal, because these companies work with an army of subcontractors for financial and legal reasons, whose names and identities are continuously changing. This relation between visual representation, which is the job of designers, and what this complex reality actually looks like, is central to the question of what graphic designers do today. 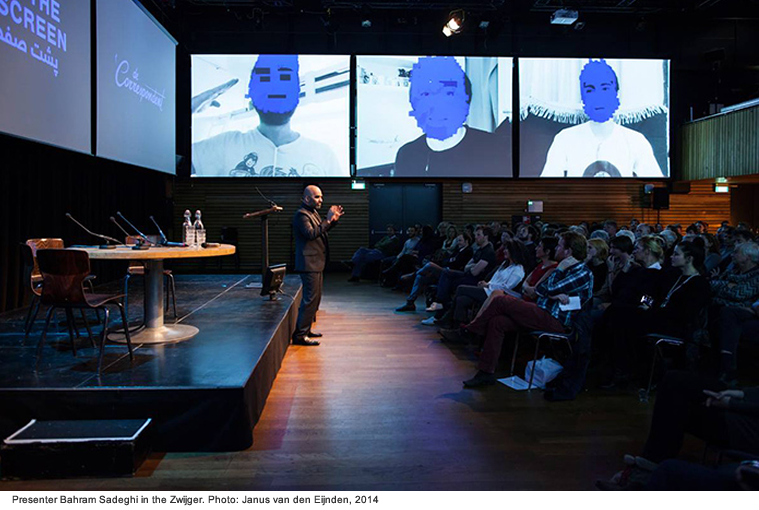 Filippo Lorenzin: To design doesn’t mean just to choose what to show, but also and especially what can be shown and what’s worth of being shown; Behind the Blue Screen (2014) is a project that explores this aspect of designing as practice to a politically engaged level that I couldn’t find in any other of your works. It’s not just a matter of protecting the persons who wanted to share their stories without being recognised; it’s more about the creation of a safe space that actively confronts the official censorship using its own tools – in this case, facial recognition and the colour blue. Could you tell more about this need to design hiding devices instead of exposing tools? 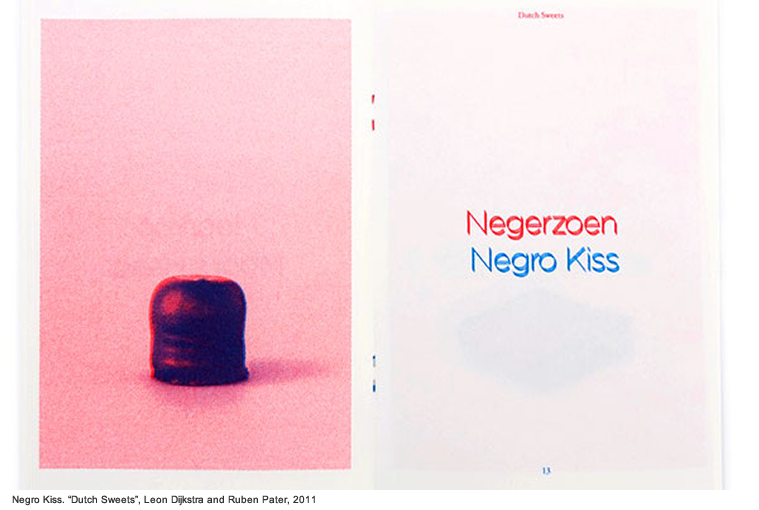 Ruben Pater: It is interesting that you juxtapose concealment and exposure. Even though the latter is usually the goal of the graphic designer, concealment is just as much part of graphic design, albeit less obvious. I was just thinking about the graphic design of arms industry companies. The graphic design of this industry has the purpose to conceal instead of to expose. I mean it would not look very nice if designers would show what this industry does, which is to kill and hurt people as efficiently as possible. So as a designer your whole job is to do the exact opposite, ignore this reality and create a fictional story about things like patriotism, fear of the unknown – safety of your own kind, and glorifying technical engineering (the fastest, the strongest). As a tactic, concealment by blending in is very interesting and will become more so in the age of information overload and omnipresent digital surveillance. 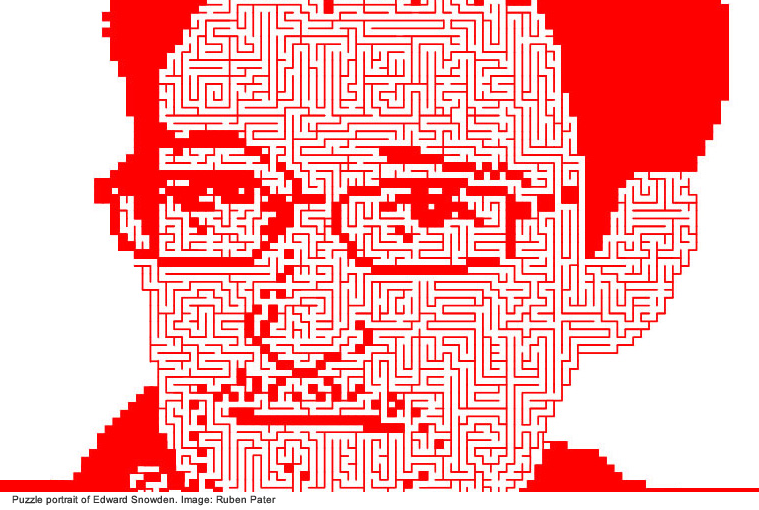 Obfuscation is a term often used when it comes to hiding from surveillance in plain sight. This is a far more efficient and practical strategy than standing out. 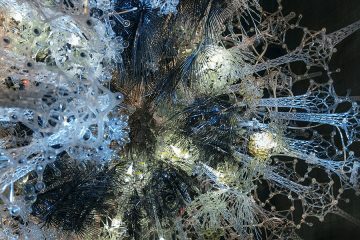 Filippo Lorenzin: You’re interested in drones from the peculiar point of view of biologists. If Twenty-first Century Birdwatching was a project that used the language of birdwatching to expose the dangers of being caught under a flying drone, A Study Into 21st Century Drone Acoustics (2015) recalls an ambient music project; you recorded the sound of the most used drones in the world and the result is surprisingly spontaneous- it seems to listen to animals behaving in their own habitat environments. What do you think? Ruben Pater: It is important to note that these sounds were not recorded but sourced from public websites like YouTube and Vimeo, just as the drone silhouettes were found in online sources. Using public sources was not the intention, but it was practically impossible to record this ourselves. Using public sources is something I like because you do not pretend to know everything yourself or do everything yourself. We are always building on the achievements of others. Just make sure you credit properly and give back to the community, that is why both projects are free to download under a Creative Commons license. The bird metaphor is not new, and quite obvious since military drones are called Parrot, Hummingbird, Global Hawk, Sentinel, Killer Bee, Scan Eagle, etc. 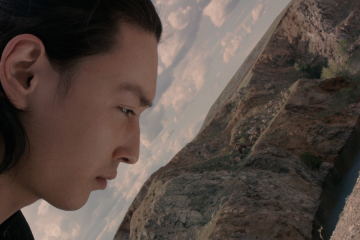 However, the metaphor offers some perspective on imagining how we deal with our physical surroundings in the future when thousands of drones could be flying in our skies. To what extent can lawmakers protect citizens if we do not know which drones are or commercial, armed, or unarmed? It will be difficult to provide the security which we now have with radar systems and prohibited airspaces in the West if there are thousands of drones flying around. The idea that citizens have to protect themselves from drones, whether it is their privacy or their livelihood, is already a horrific reality in countries like Mali, Somalia, Yemen, Libya, and Pakistan. Countries that are not officially at war but where assassinations by military drones are carried out regularly nonetheless. So this is not just about a metaphor, but mostly a warning that the ways of waging war are quickly changing from official, centralised acts of violence, to what has been called a state of perpetual warfare and the everywhere war. 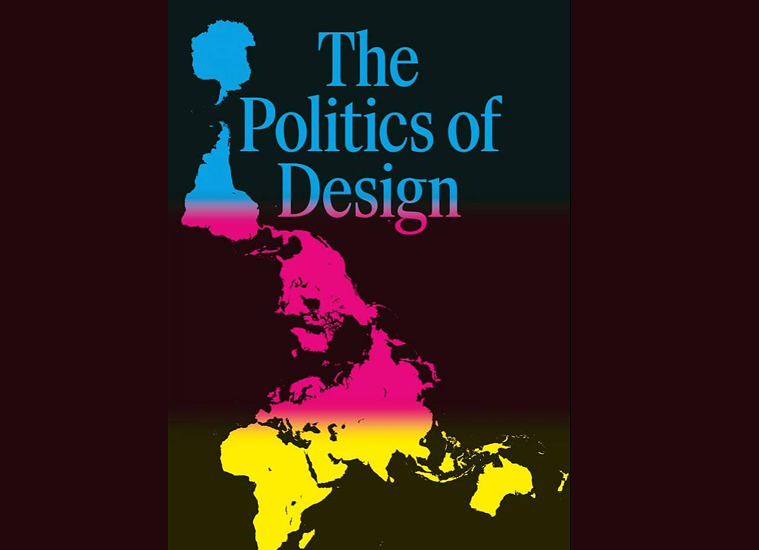 Filippo Lorenzin: Let’s talk about your new book, “Politics of Design”. It’s a work that summarises your reflections, a project that exposes the political and social value of design – basically, what we’ve talked about in this interview. Could you tell more about the aims of this book? What is the difference between what people could learn by looking at your website and what they could read in it? Ruben Pater: Even though the subject was something I had been thinking about for years, making the book was very different from my other work. To put these ideas into a book was a quick idea, and when a publisher wanted to go with it I just went out to make it. I spend so much time reading, it’s kind of true what they say: to write one book, you have to read a hundred. 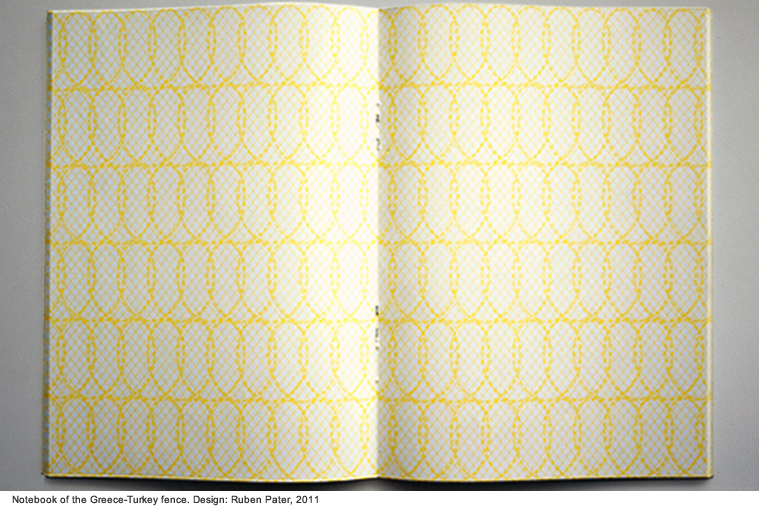 For me, everything starts and ends with design, but this book ended up with very little design in it. I wanted to make it as cheap as possible, attractive for non-designers, and well legible. Those restrictions basically created the design. Now I see it mostly as a collection of texts and images to tell a larger story, so there are not the visual narratives I try to create in my other work. It did not feel appropriate or necessary to do this. It was a great experience to write the book, but I am now longing to do more visual work. In relation to my other work, the book, the blog (which is an ongoing extension of the book) and the different talks and lectures I do about the topics, is an exercise in thinking about design education and design history which will keep going on parallel to my other work. The website works great for the work I am doing at the moment, and I’ll try to do an update soon. Even though it is more aimed at reading than image browsing, it still serves its purpose in reminding myself and others that designs are never created in a vacuum, and the context in which design is created should not be ignored but embraced and cherished. 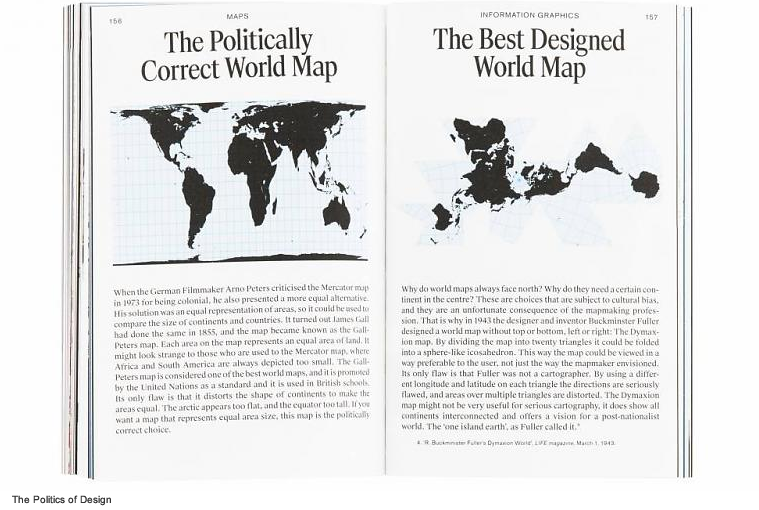 In that sense, my website does have a relation with my book; both try to use visual examples to explain to political and social realities that designers have to work in.